Why day Stock Traders Lose Money In Share Market ? 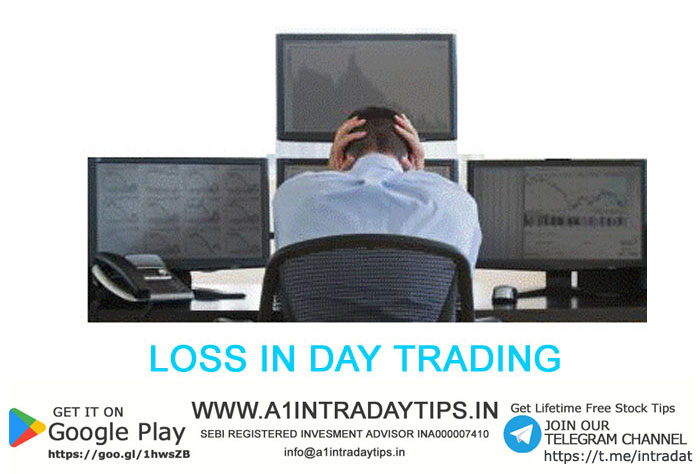 A1 Intraday Tips has explain's why day traders loose the money in stock market because Generally 90% day stock traders loose money in day trading in today’s smart and intelligent world, almost 90 % of the Intraday stock Traders experience loss in the share market because of their low knowledge and expertise in the stock trading. The Intraday Traders just blindly trade on the basis of the rumors they hear terming them as best share tips. They do not trade as per the trend in the share market. At A1 Intraday Tips we assist people regarding the ways of trading in the volatile trading market. In case the traders don’t have sufficient knowledge regarding the share market and are in search of some free stock tips we would advise them not to get involved in the share market trading. It would be advisable to first do dummy trading for initial one or two months so that you get a hang of it. Once you understand the flow of the working of the market, you can jump into the real market. For avoiding a loss in Share tip trading, trading without a stop loss might not be such a good idea. You should also not average the loss because once the capital is lost; you will have to step out of the share market whether one will or forcibly. You cannot expect to become a multimillionaire overnight. Thus, you should not invest all your capital in stocks trading together. It is just impossible and also quite difficult even for the professional and regular traders of the stock market to earn profits. Usually the Share tips traders earn profits all of a sudden and then bear position of loss for a very long time and they also average on each and every low trading by buying more and more stocks. Share tips suggest you to trade according to the trend of the market and not to average in loss and get out as soon as loss triggers. Some of the share tips traders regularly go through a number of business magazines, daily newspaper tips and business channels on television for getting reliable share tips for trading. It can be quite dangerous sometimes because some of the Technical Analysts would suggest buying some stock, while others might suggest selling it. This confuses the traders. You can take help of media if you wish to learn the basics of the Indian share market as it is a good share tips provider. In case you are an amateur in the market of Share tips Traders we bring to you 11 basic and Golden Rules for Share tips Trading. How can A1 Intraday Tips can save you from losses? A1 Intraday Tips has a team of experts who have experience of dealing in the share market for more than twenty years. A1 Intraday Tips also, has a team which delivers money making positional / delivery calls in the Stock Market. A1 Intraday Tips believes that trading as per the current stock market trend can only render you profitable results. In case the market is in the bullish trend, A1 Intradaytips Tips gives buying calls. On the other hand, if the market is bearish tend, A1 Intraday Tips gives selling or short sell calls. A1 Intraday Tips keeps an eye on the stock market 24*7 and thus you don’t have to keep a track of the market. There is no need to go through some business magazines or business channels. Our www.a1intradaytips.in website will give you minute to minute update about the stock market and also about our performance report daily after market hours in not more than 10-15 minutes. A1 Intraday Tips gives you a free 2 day trial for checking our accuracy as well as trustworthiness of our Share tips services. A1 Intraday Tips employs the most advanced technical software and technology & also the fastest premiuim gateway for sending messages to our paid members so that they can trade with the same price what we suggest. We have a very strong and automated payment gateway for helping our members to make payments easily. Your Membership account will be activated immediately so that you do not have to call us again. Our website is fully automated and thus in case of any query you can just fill the quick contact form, our executive will call you within 24 hours. Allways Trade without Stop Loss. Do Not Average in Loss. Allways Learn from Your Trades. Trade with the Market Trend. Allways Define Targets and Stop Loss before you Trade the Stock and Stick to Same. Don't Change the stop loss under any circumstances.